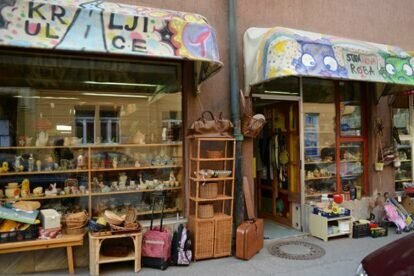 “First thrift store in Slovenia”, which is how Stara roba – Nova raba is promoted. The name has a nice play on words in Slovenian and it means: used items – new usage. It was founded by Kings of Street, an independent non-governmental self-help and support organization for the homeless. They get used items for free and they sell it for very little. All the earned money goes to the homeless. It’s needless to say that this place is full of interesting things and full of history. Old cups, paintings, plates, vases, even telephones, jewelery, pins and so on. The list is endless. Anyone that likes these kinds of things will enjoy this place a lot. The shop is a bit further away from Gostilna dela (check the Gostilna dela article) and not long ago these two socially conscious projects connected. When eating in Gostilna dela you eat and drink from plates & cups that are from this shop and can be also bought.